Don't let the word "custom" scare you. The word "custom," to us, simply means that we will provide you with a solution that perfectly suits your needs and fits within your budget. We do everything under one roof, by ourselves: design, prototype, develop, cut, fabricate, weld, assemble, program and test. 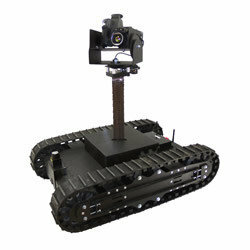 We cover all aspects of custom robotics solutions development from start to finish. This includes in-house CAD design, machine control software development, machine building, safety, testing and commissioning. Our team of professional engineers cover a broad range of disciplines, enabling us to develop the best solution for your needs. We can also integrate off-the-shelf robots as well, and recommend this option where suitable as the cost of these systems has significantly reduced in recent times.